Have you ever seen a Tasmanian Tiger? Probably not. Neither have I, and that’s because they’re extinct. I didn’t know these even existed at all until my recent trip to Australia, where I also got to know another extinct beast a little bit better: the Holden HSV GTS. In case you haven’t been keeping up with the Australian car industry, both Holden, the local arm of General Motors, and the country’s Ford division shut down domestic production in 2017 and 2016, respectively. The Australian icons that were the Holden Commodore and Ford Falcon have gone the way of the Tasmanian Tiger. The Commodore has been a household name in Australia since it was introduced in 1978. Over the years it has evolved over four generations, becoming as culturally important to Australia as kangaroos, Kylie Minogue, and the Sydney Opera House. This year would mark the Commodore’s 40th anniversary. I couldn’t go to Australia without paying tribute to this once great icon and I wanted to do it properly. I jumped straight into the deep end and got a Walkinshaw Performance W557 HSV GTS. This car started out in life as a humble Commodore sedan, the sort of car used by everyone in Australia. Americans know this car as the Chevrolet SS. Here, it’s way more common than that hoon-mobile mostly driven by Chevy die-hards, Jalopnik readers and other weirdos; in Australia taxi companies, the government, and the police all use Commodores. It’s roughly the same size as a BMW 5 Series but obviously doesn’t cost as much as one. There are several versions available and have been traditionally powered by either a six- or eight-cylinder engine. Up until the latest generation they’ve been stubbornly rear driven. Then comes HSV, or Holden Special Vehicles, Holden’s performance arm. Think AMG, but more Australian. They take the top end Commodores and poke them with a stick, and they throw in a LSA engine for good measure. The result is the 580 horsepower HSV GTS in its standard guise. That puts it on par with some of Europe’s best performance sedans. 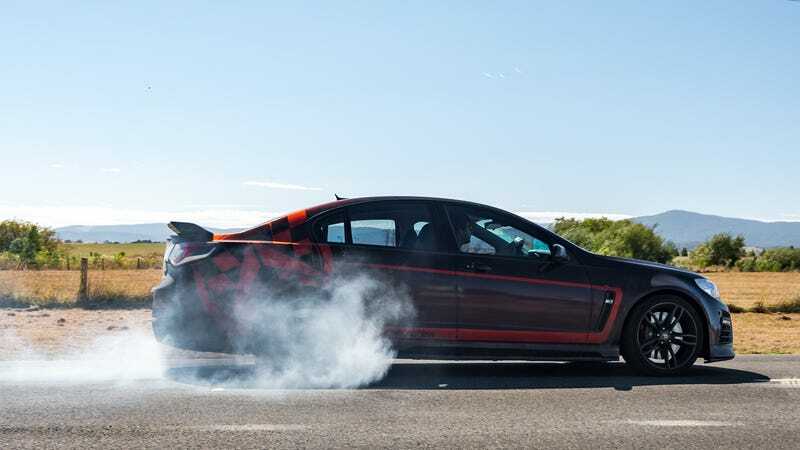 However, that obviously wasn’t enough for the hoons at Walkinshaw Performance. To solve the tragic power shortage they’ve given it nearly 200 HP more, and the result is the car you see here. Walkinshaw Performance was able to provide me a W557, their version of a tuned HSV GTS. The “557" in the name is for the number of kilowatts this brute produces. I don’t know why Australians measure an engine’s power in kilowatts either, but 557kW roughly translates to 750 HP. Supercar power levels a rear-wheel drive four-door sedan. Now this is how you do an Australian road trip. The plan was to explore Victoria and immerse myself in the local car culture of Melbourne with the W557. It’s like how people want to drive a Nissan GT-R when they go to Japan or a Ford Mustang in America. Driving a Holden Commodore when visiting Australia is basically a must on TripAdvisor. The firm behind this car was founded by Tom Walkinshaw, from Tom Walkinshaw Racing fame, and is a successor to TWR. In 1987, Tom Walkinshaw started his relationship with GM Holden taking over their race team and then later moving on to their road cars. Using what they’ve learned with 45 years of experience on the road and race track, they’ve applied their knowledge to the performance upgrades to Holden’s HSV vehicles today. The W557 package can be done on any LSA-powered HSV. Existing HSV or Walkinshaw cars can also get the W557 package retrofitted. If 750 HP is too much, or if you wish to keep your license, they do offer less powerful packages. The best thing about the Walkinshaw upgrades is that it’s all still covered by the standard warranty. Upgrades here include ceramic coated headers, dual active cat back exhaust, cold air intake, ECU calibration, camshaft and valve spring upgrades including WP spec camshaft, cam sprocket, camshaft bolt set, crankshaft bolt, and beehive-style valve springs. For cars receiving the upgrade with more than 20,000 kilometers/12,500 miles, new head gaskets, head bolts, OEM lifters, and lifter guides are added. The package costs AU$12,990 from new, or AU$4,990 for existing W507 customers. A 937-mile road trip in this over a week was plenty of time to form a bond with this beast. From the outside it looks like it’d be a rough, harsh thing, but it’s surprisingly comfortable. The rather sophisticated third-generation magnetic dampers (MRC) helped a lot. There’s four modes to choose from; Tour, Sport, Performance, and Track. Most of the time I just switched between Tour and Sport. The suspension was nice and plush on Tour, which was great for the long distance stints and Sport was better suited when the roads got a bit more exciting. Oddly enough, in the city Sport was the better bet as the suspension seemed to react to imperfections a bit better. Another advantage to taking this car on a long road trip was the sheer size of it. Even with four adults inside there was still plenty of space to get lost within the cabin. It’s basically just a muscle car with a touch of European sophistication and a heavy dose of Aussie charm. What amazed me even more was the amount of bang for buck you get. As a new car the total price of a W557 HSV GTS would be around AU$115,000, which is less than a BMW M3 and roughly half that of a M5. No wonder these cars are so beloved—you get more power than the Germans, some local flavor, and enough space to carry all the Vegemite your family can meet. Like almost every Aussie I’ve met, it’s a loud thing. The engine dominates the entire driving experience. It could be the least sophisticated car in the world or have the most luxurious interior none of that would make a difference as the 6.2-liter supercharged V8 pulls like it has infinite power. The last time I experienced a Holden was a SV6 Commodore and that only had 280 HP. This nearly has triple the power of that car, which was still enough to make the wheels keep spinning around. Sure, in a supercar you expect that sort of ridiculous power but in a humble family sedan the feeling of never ending power can be quite overwhelming. 750 HP and 686 lb-ft of torque will have the effect. Keep in mind an Audi RS7 or Mercedes-AMG E63 “only” have 600 horses. The acceleration isn’t violent—the Nismo GT-R and McLaren 720S were more mind-boggling—but in the W557 it felt just more ludicrous. The lack of turbo lag helped it out a bit, it made the power delivery feel more instantaneous. The noises it made was completely and utterly silly. It’s a true, proper old school V8 rumble. No fake exhausts pops and crackles, no muted turbo noises here. In its standard Tour mode it’s what most people would describe as being “loud.” Change it up to the sportier settings and it emits a deep and low boom. Is it the most anti-social four-door car in the world? Quite possibly. It’s the sort of noise you’d expect would be able to knock down buildings or cause avalanches. Once you get going the supercharger whine adds to the drama of the whole experience. It’s not as loud as other blowers out there, you still get more V8 noise but it’s a nice touch to an already silly soundtrack. The handling was, put simply, not European, and exactly how you’d expect a 4,000 pound car to handle. It was big and cumbersome. On some of the twisty parts of the Great Ocean Road it felt like it didn’t want to be there at all. It would much rather be sat at home on a big soft sofa watching a footy game. That said, the chassis felt like it could more than cope with the power this thing was producing. It felt predictable and controllable, even on the odd occasion when the back got a bit too excited. The brakes were effective but the feel left some to be desired. Steering was meaty and nicely weighted, with a true old-school feel about it though the steering circle was hilariously terrible. It had more issues too. The infotainment system, which was similar to other, now older GM infotainment systems, was unintuitive and would’ve been outdated 10 years ago. The wing mirrors were disproportionally small for such a big car. While the size was great for road trips, there were times I thought it was a bit too big. The size became obvious on the tight roads in Melbourne’s city center. It felt more appropriate in the countryside, like wearing an Akubra. Also, the running costs were hilariously bad. Filling up the 70-liter tank cost around AU$100+, and we must’ve gone through at least five full tanks during our time with it. At the end of the trip the best average we got was around 10 mpg. Bear in mind most of the driving was done on open country roads and freeways. This is a thirsty machine! There’s also a bit of an image problem. Sure, you can get this car in a more discreet color choice, but the HSV and Holden badge isn’t exactly something the Queen would be seen in. As more Aussies get richer they want cars and badges to match their new lifestyles, hence the plethora of European SUVs around the leafy parts of Melbourne. It’s no surprise the true Aussie Commodore is no more. Big sedans just aren’t for this world anymore, especially if they don’t have a fancy badge on them. For all the flaws this car has there’s one fundamental aspect about this it that makes up for all of them; it’s character. I’ve never driven a car that’s encapsulated the spirit of where it’s manufactured like this. It’s big, it’s loud, it’s unapologetically down to earth, and an absolute laugh. Everywhere I went in Australia, even with Paganis in sight, people still gave the W557 the time of day. Maybe it was the silly wrap or they knew what lies beneath, but there was a real sense of fellowship for the Commodore. It’s one of those things—everyone knows someone with a Commodore. For many, it was understandably a sad day when the local Commodore died. Falling sales, high production costs, demand for eco-boxes marketed as SUVs and crossovers meant it was bound to happen sooner or later. Much like the Tasmanian Tiger, I didn’t realize how much worse off the world is without this uniquely Australian creature. The Commodore name may still be being used today, but there’s only one original, and like Kylie said, I can’t get it out of my head. Same color, similar power, very different cars.